Welcome to our comprehensive Giantex large electric wall mount fireplace heater review. Spoiler Alert: Update Prices fluctuate on Amazon but this fireplace is currently just over $100. We really like this decorative fireplace in the budget category.If you like the fashionable, clean look, this may be the one for you. It also has an unusual curved front. NOTE: If you have arrived on our site and have decided to buy the Gigantix electric fireplace then we recommend clicking through to discover the lowest price and the daily discount. At time of publication it was around $100 – a great deal. You will get very fast delivery and it’s often free . Welcome to this review of the Giantex 35” XI Large Adjustable Electric Wall Mount Fireplace Heater with remote. We will take a good look at the fireplace and explain all of its features, so that you can make the decision if it is the right fireplace for you. We will examine the pros and cons of the fireplace as experienced by customers who purchased the product. With its’ clean classic lines, this wall mounted fireplace will look appealing in any room. It can be used in your home or office, any where you might otherwise hang a large picture. There is no venting needed, and no pollution or off gassing fumes from this fireplace heater. It will provide enough supplemental heat to make your room cozy. It has a dancing, natural flame effect for mood and ambience. The flame effect on this fireplace are 3D and looks realistic. It provides a nice ambience, and it is very soothing to look at. The flames are powered by energy saving LED’s that will not require replacement at any time. The black tempered glass front is curved and very elegant, and the glass will never be hot to the touch. The glass can be removed for cleaning. There are three different flame effect settings where you can adjust the brightness of the dancing flames. The colors of the flames cannot be changed on this fireplace. It is possible to just run the flame effects without the heater being switched on. There is also a glowing log effect with this fireplace which looks good. The Giantex 35” XI Large Fireplace has an electric heater with three heat settings which are high heat, low heat and no heat. At the high heat level it will provide a maximum output of 1500 Watts. The low heat setting will provide an output of 750 Watts. The heater works on a forced air basis, and the heat is distributed from the top of the fireplace with a 3 speed fan. There is no thermostat with this heater, but it does have a thermal cut out function if it detects any overheating. There is also a built in sensor which shuts everything down if the fireplace has tipped over. The 3 speed fan in the heater is quiet when it is in operation. So how much house will it heat? Well in reality, that depends. 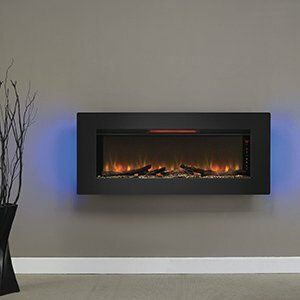 The following wall mounted electric fireplaces have been comprehensively reviewed at Cozy By The Fire. The Giantex which you are currently reviewing is the most budget friendly wall hung fireplace we have completely reviewed. If you are willing to take a look at what a bit more money can buy, we have some suggestionsJust click on the text link to go to the review. Clicking on the images below will take you to Amazon for more information and today’s lowest discounted price. 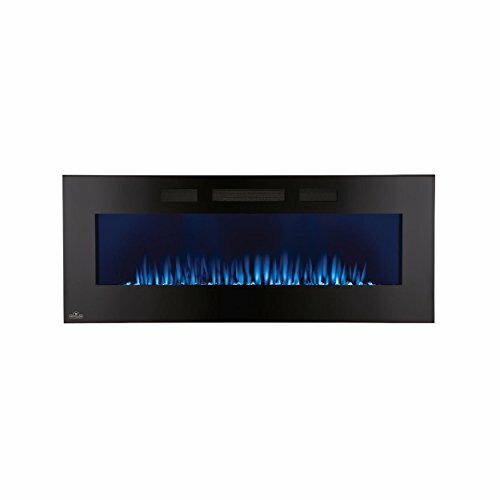 Touchstone Onyx Wall Mounted Electric Fireplace – 50 inch. Available in Black or White. The fireplace has a set of manual controls located on the top of the unit. 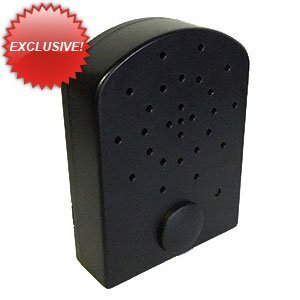 It is also supplied with a fully functional remote control. The remote uses infra red technology so you will need to point it directly at the fireplace for it to work. The range of the remote is limited. There are three controls which are the on / off button, the heater button and the flame intensity button. The on / off button will provide power to the fireplace and turn on the flame effects. When it is pressed again the fireplace will be turned off. When the fireplace is turned on the heater will not be operational. The heater button will need to be pressed to select the low heat or high heat option, or to turn the heater off. The flame intensity button can be used to brighten or dim the flame effects. The remote control has exactly the same functionality as the manual buttons. “The price is very good” – In fact it is great! “It was really easy to install.” Mounting bracket and clear instructions included. There were a lot of positive comments about the price of this fireplace. Some said that it was great value for money, while others were amazed at what they got for the price. Many people liked the look of the fireplace and most thought that it looked really good on their wall. There were other comments such as “elegant” and beautiful”. A lot of people loved the curved glass. Most of the customers were happy with the flame effects and the general feeling was that the fireplace created good ambience. There were lots of comments about the flames looking realistic. Most of the customers were satisfied with the heat output and there was one who commented that the fireplace heated their 14 feet square room very well. People in general felt that the fireplace was easy to install. The wall mounting brackets were helpful, and the mounting instructions were clear and concise. A couple of customers stated that they thought the heater fan was too noisy. These were minority comments as most of the customers did not make similar comments. One customer made the point that the fireplace did not heat the room up as intended. The customer did not specify the size of room where the fireplace was located. Since the manufacturer makes no claims, this is a matter of the customers own expectations not being met. Under the heating section of each review we try to bring customers expectations into reality. The complaint about damage this was really a complaint about shipping. It is just bad luck that the customer received a damaged fireplace and a new one was dispatched, so this is not a problem. That is the advantage of buying through Amazon – great customer service. This electric fireplace heater has built in tip over protection as well as an automatic shut off if the unit gets too hot. For more information see electric fireplace safety tips. How easy is the assembly and mounting of this wall mounted fireplace? It is very similar to hanging a heavy mirror or picture.The mounting bracket is included with the fireplace. Items included are for a standard dry wall mount. If you need to mount in stone or stucco you may need a trip to the hardware store for anchors. This really is a n under 1/2 hour job. Click on the link for: detailed instructions on how to mount a fireplace on the wall. 1. Secure mounting bracket to the wall. 2. Clip the heater box on the mounting bar..
heat together and just the flame effect alone. What does that mean? If you use your unit in high heat mode for 2 hours a day for a month it will bump up your electric bill by about $8.00 per month. In flame effect only mode, same conditions your bill would go up by $.60. 1. First go to this site and determine your states energy cost per KWH; or you can get it off of your electric bill (use residential column). For examples above,I used the US average of $.12/KWH. Click Here to determine: Your states energy cost. Values= 1500 watts high heat + flame, 750 watts for low heat and flame. Fill in your states KWH cost, the hours you think you will use it per month and generate results. The fireplace measures 35 inches in length by 6 inches in width and it is 22 inches high. 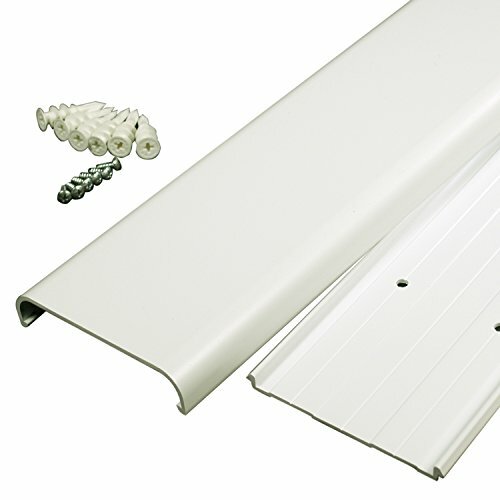 It is designed to be mounted on a wall, and a mounting kit is supplied. The product weighs 30 pounds and it is powered by a standard 110 volt electrical supply. There is a user manual supplied with the product. At about$100 the combination of low price and good features make this one of the best values we’ve come across in doing electric fireplace reviews. It is a great value. 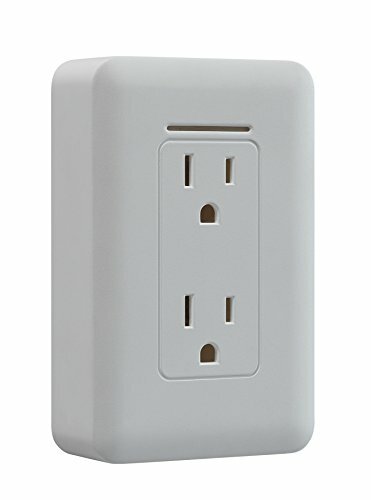 Although there are even higher priced electric wall mounts, this one does the essential job without those expensive bells and whistles. There were a number of customer reviews for the Giantex 35” XI Large Fireplace and 68% of the reviewers gave the fireplace a 5 out of 5 star rating. A further 19% gave it a 4 out of 5 star rating. This is 87% overall which is good. If you are looking for an elegant fireplace that has a good heater and very nice flame effects, then the Giantex 35” XI Large Fireplace is certainly a good option. The price of this unit is very reasonable and the product is recommended. 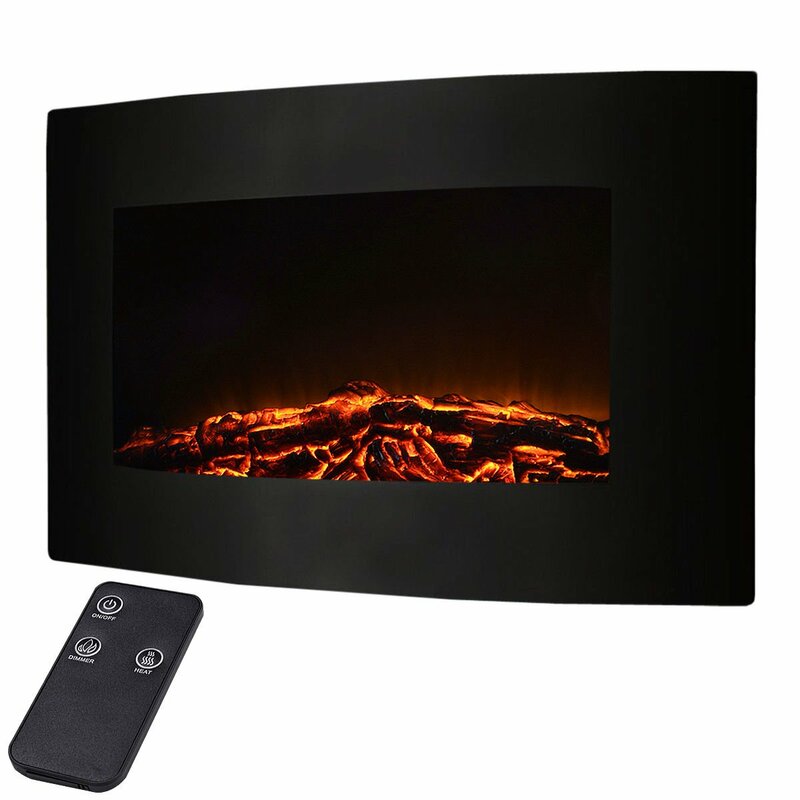 We hope you enjoyed our Giantex Large Electric Wall Mount Fireplace Heater Review.